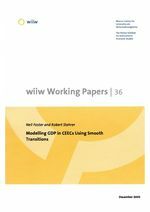 This paper employs smooth transition models to investigate the GDP series of ten CEECs. Allowing for a transition in both trend and intercept we examine the response of GDP to reforms in CEECs. Our results indicate that in only a small of number of countries is there evidence to suggest that the impact of the reforms on long-run growth has been positive. In most cases there has been no significant impact of the transition on the trend growth rate. There also appears to be little difference in terms of the depth of recession, speed of adjustment and the impact of reforms on GDP growth depending upon whether a country adopted a gradual or a fast approach to reforms.